What's so kosher about kosher salt? Get all the facts, myths, and tips. It's taken over the gourmet world. You pretty much wouldn't write a recipe that includes salt without it. It's also an annoying fact of life for those of us googling "kosher" recipes - that yummy salt bumps up almost every recipe to the top of the list even if it's a recipe for bacon double cheeseburgers. First of all, you may already know that "kosher" salt is no more or less kosher than any other salt. That is, it's kosher, but so is table salt, coarse salt, sea salt, Himalayan pink mountain salt, and every other form of pure salt. So if you eat kosher and cook kosher, you CAN use kosher salt. But you don’t have to. So why is it called kosher? That’s actually just a mistake. This flattish crystalline form of salt is actually kosher-ING salt - the kind of salt used to "kasher" meat to make it kosher. Most kosher salt has air between relatively flat crystals. So when you're using or substituting kosher salt, use "more" of it - the same amount by weight looks like more on a spoon, so 2 tsp of regular table salt will be just as salty as 1 tbsp or more of kosher salt. Many people claim it has a “lighter” flavour, but in reality, it tastes the same as any other salt – you’re just using less of it. If you’ve ever heard the “Lime in the Coconut” song – don’t worry. There’s no “bellyaching” here, just a whole fluffy heap of summer-Shabbos deliciousness. On a hot day, it feels like there is no taste more perfect than lime and coconut mixed together. Happily, I discovered a couple of years ago that you can WHIP the cream that rises to the top of coconut milk. Is there anything more perfect, you ask? No, there is not. 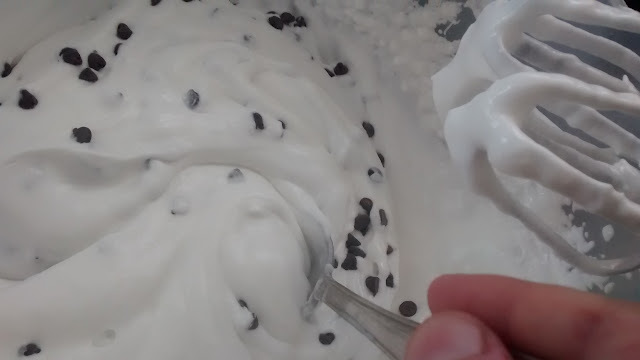 Well, okay... it does get a little more perfect, when you stir in just a small handful of tiny chocolate chips. Mini chocolate chips work best, because they're awesomely subtle, but really, who's going to complain that their chocolate chips are too big? This isn't exactly a recipe, more like a method. You'll need well-chilled coconut milk or coconut cream, so stick it in the fridge overnight before you open the tin. Only use the coconut cream that's congealed. Whatever liquid is in there after you scoop out the white stuff is incredibly tasty on chicken, so hang onto it and use it for something else, because it definitely won't whip. Pull out 2 tins of well-chilled coconut milk. Before it can warm up, skim off the solid white stuff on top and add it to a bowl. Add 2-3 cubes of frozen lime juice (maybe 4-8 Tbsp? ), to taste. If lime juice is frozen, let it thaw a little before starting to whip. 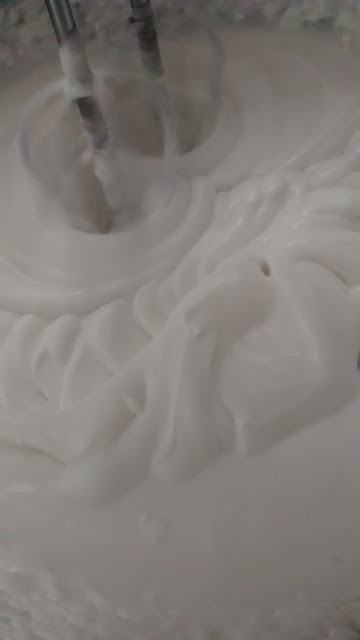 Whip the white stuff until it gets reasonably firm (it may take a while if it's a warm day, but it WILL whip, so keep going). 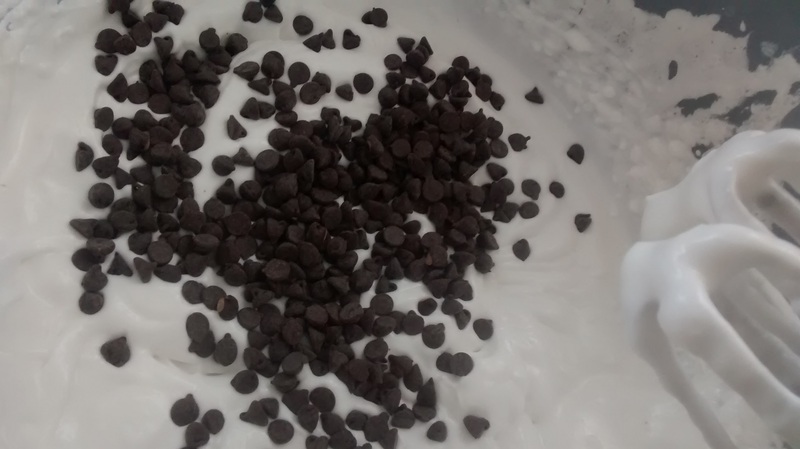 Once mixture is fully whipped, gently stir in chocolate chips and transfer to freezer. Are you sick of kugels but aren’t sure what else you can make to serve on the side of a Shabbos or Yom Tov meal? Here’s something that’s just as EASY as a kugel, only in tasty, crunchy, bite-sized morsels. Last week, I wanted something like the Alexa brand sweet potato “tater tots,” which by all accounts are absolutely delicious. We can’t buy them here, so I knew I had to make something from scratch. My puffs came out totally different, but utterly delightful in their own right. They’re a great way to sneak even more of that sweet potato goodness onto your family’s menu. Bake or boil the sweepoes (I boiled mine), puree them with egg yolks, cornstarch and seasoning, and then coat the mixture with panko before baking. I added a little melted coconut oil to the sweet potatoes; you could probably leave it out OR substitute canola if you wanted something subtler (there wasn’t a strong coconut taste, however). Everybody loved the taste and texture of these! Here, I’m pureeing the sweet potato. I added everything in here: egg yolks, cornstarch, coconut oil, salt and pepper, plus a little cinnamon. You can leave the cinnamon out if you don’t like it. I let the mixture sit in the fridge for a while in the food processor bowl to firm up a bit before scooping it out. I think this really helped, though it was still rather mushy. Happily, we had panko (Japanese bread crumbs) in the house. I mixed in a little melted coconut oil, plus salt and pepper. 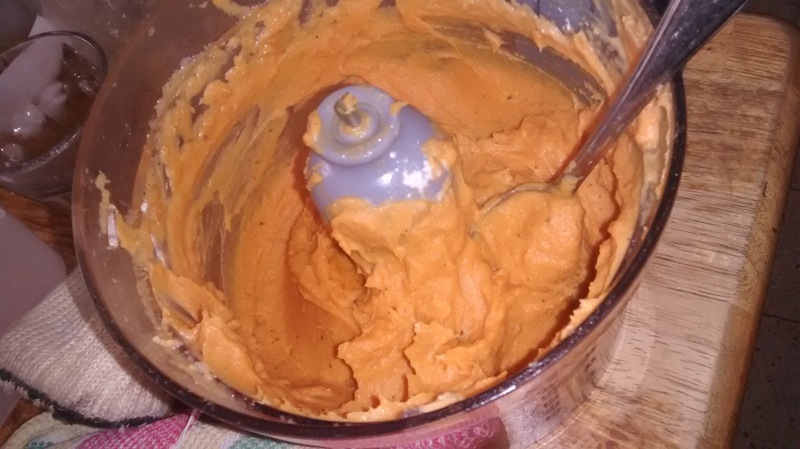 Then, I just dropped in the sweet potato mixture by tablespoons-full. Because they were so mushy, I tossed crumbs over them lightly with a fork to make sure they were completely coated before transferring to the baking pan. When I first found out that Judaism had a holiday specifically for celebrating dairy foods, my first thought wasn't cheesecake. My first thought was... gulab jamun. What the heck are gulab jamun??? If you love Indian food as much as I do, you probably already know. When I was a toddler, my father flew to India with an Indian friend and had the time of his life. He came back with a pair of lovely white linen "day pyjamas" that he'd save for special occasions, a love of delicate nose piercings and an insatiable appetite for Indian food. Ah, but Indian food. Fortunately, that was one appetite which he shared generously with us (except his love of okra). Since moving to Israel, I've been on a quest for good Indian food here, which has not really gone well. There was a place in Jerusalem for a while, but apparently it is no longer under hashgacha. The food wasn't THAT great anyway, at least, not compared to the Coxwell & Gerard corridor I used to haunt in Toronto before I started keeping kosher. Do you have a problem with ice cubes? Come on, hands up. I know I do. Working in one of the World’s Tiniest Kitchens, I appreciate any solution that saves space, time, money, and hassle. And living in Israel, I need – desperately! – to stay cool all summer long. Oh, yeah, and if I can spend less than ten bucks, all the better. Last summer, I bought these silicone freezer pop molds for my husband. Back in Toronto, he had a brand of storebought freezable juice pops that were 100% juice that he loved as a refreshing summertime treat. Here, everything is made with a ton of sugar, so I thought he could use these to make his own. Weirdly, and to my great sadness, my husband didn’t take to them. So they’ve mostly sat empty and unused for the last year. But when the weather here started heating up last month, I had a flash of realization: ICE! Around here, the answer is... VERY. These quick, easy, eggy muffins are exactly what you need: the cure for Hangry. Shh… don’t tell anybody: they’re basically little mini-quiches, just without a crust. These are sometimes called "scrambled egg muffins." But on most sites, you'll find them chock-full of some type of meat that just won't work in a kosher kitchen. Pork, ham and bacon are all super-popular at breakfast time, apparently. Even if you could use some kosher kind of meat, you'd miss out on all the cheesy goodness of these delighful, bite-sized breakfast treats. So why bother? Just toss in lots of veggies and you'll never miss the bacon, I promise. Make your life super-easy and prepare these in reusable silicone muffin cups. My fellow Israelis are ridiculously huge fans of desserts involving what are basically soggy cookies. This may have something to do with the fact that the horrendously misnamed “petit beurre” cookies are absolutely everywhere. These cookies are analagous to the Social Tea biscuits we used to buy back in Canada. They’re misnamed (in Hebrew, “פתיבר” – all one word) because, being pareve, they don’t contain a single drop of butter. I’m sure they’d be a great base for desserts of all kinds, but actually, the pareve ones aren’t a bad substitute. Perhaps the best-known and most-loved of these treats is Kadurei Shokolad (כדורי שוקולד), literally Chocolate Balls. When I told my kids we were having them, they literally jumped and shouted “yay!” GZ (age 7) was not too thrilled when I told him he’d be making them himself, but he got into it quickly. These are super-easy to make, and tons of fun to do with kids. I recommend having a variety of sprinkly things on hand to roll them in. We didn’t; in fact, our sprinkles ran out halfway through, so we ended up coating 3/4 of them in plain cocoa. Which is fine. Icing sugar would work fine as well. So would Demerara sugar. I’ve always loved the way Shoshana at Couldn’t be Parve turns out gorgeous gourmet marshmallows in flavours like Blood Orange, Rose and Raspberry Lemonade. She makes it look easy, and the truth is, I’ve followed her recipes and they’re not difficult. But as with most marshmallow recipes, they involve hauling out a thermometer (and I don’t have a real candy thermometer, just a digital one that I dunk into things as needed). Most marshmallow recipes also call for corn syrup, though Shoshana does offer a liquid invert sugar “marshmallow syrup” recipe that I’ve used several times. It works, but it involves extra steps that add to the “patchke” of making marshmallows from scratch. When we were invited to gluten-free friends for lunch, I saw it as a great opportunity to make marshmallows again. But I REALLY wasn’t looking forward to monitoring the temperature or doing the invert-sugar step. Out of curiosity, I started googling thermometer-free recipes, and found this one, which was also – as a bonus – corn-syrup free as well. I missed photographing the early steps of prepping this, but it’s very straightforward. REAL Gelatin, not unflavoured kosher jelly-style dessert pudding mix or any other thing that makes a jelly-type pudding. A stand mixer. Any marshmallow recipe needs about 10-15 minutes of mixing, but with a decent stand mixer, you can just start it up, set a timer, and walk away while it works. I used the last package of our Kolatin gelatin from Canada. It expired about a year ago, so I tested it first by mixing it with a little water, and it set up just fine. If it hadn’t, there is gelatin available in stores here in Israel as well. Here is the gelatin, mixed with water. You might have guessed that I haven’t been a college student for some time now. But that doesn’t mean I’m not still addicted to one of the staples of college-student life. I don’t feed it to my family, but when I’m looking to treat myself, one of my favourite indulgences is… ramen noodles. You can find all sorts of articles online about how ramen is the perfect college food because it’s something like 20 cents a packet. That’s not quite true if you’re cooking kosher. Kosher ramen has always been a little more of a luxury; I don’t think we ever found it for less than $1.99 in Toronto. Here in Israel, it’s about 4nis (about $1), though it’s sometimes on sale for less (like 5 for 10nis). Play around with it yourself and I’m sure you’ll find a combination that works beautifully for you. Feel free to share your own favourite ramen hacks in the Comments! How to turn humble onions into sweet, savory magic: caramelize them. Want a secret weapon in your cooking arsenal that you can pull out anytime to make anything taste better? One that can make the difference between a dish that's good and a dish that's fabulous? Between so-so and WOW? A secret ingredient you can toss into almost anything, because it's totally pareve and versatile? No, it’s not a dream. Yes, this magic ingredient exists... and it's onions - the caramelized kind. Is it magic? Or science? Onions are like Dr. Jekyll and Mr. Hyde. When they're raw, they're hard, sharp, with a nasty sting that makes your eyes tear up. But when caramelized, they're soft, mellow, sweet and... well, full of all that caramelly goodness. The word "caramelization" refers to the browning that happens in the onion's sugars. Sugar in an onion? You betcha. Even the most humble yellow onions have plenty of sugar, and the special sweeter varieties like Vidalia have even more. Did you know that you can actually caramelize onions in the crock pot?